Ashley Fischer “LaChateigne Living Room” 2012-2014. Image courtesy of Embark Gallery. Friday, February 5th 5-9pm – Opening Reception for Hi/Lo at Embark Gallery: Inspired by the recent rapid economic changes in San Francisco, Hi/Lo challenges extant systems of value and exposes the disparities and fallacies in that which we choose to give importance. Jurors Amy Cancelmo (Root Division), Kerri Hurtado (Artsource Consulting) and Megan McConnell (Anthony Meier Fine Arts) selected artworks that question divisions between public and private space, address housing politics, and rethink the various products and consequences of contemporary capitalism. The exhibit will be on view until March 19th. Embark Gallery is located at Fort Mason Center, Building B, Suite 330. Robert Minervini “Contemplating the Moon” 2015, acrylic on canvas. Image courtesy of the artist and Di Rosa collection. 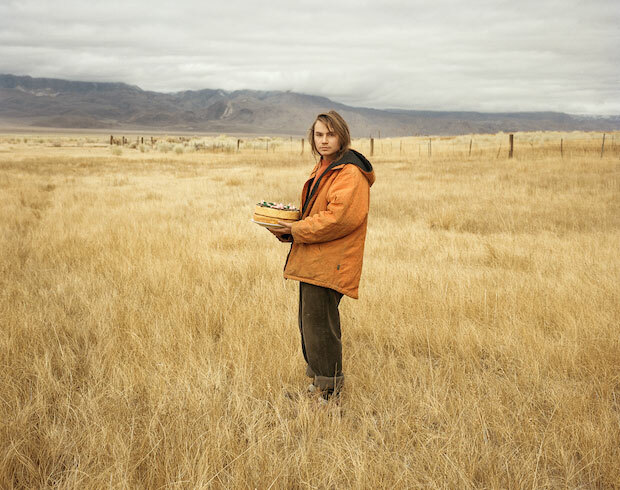 Saturday, February 6th, 4-6pm – Opening reception for Radical Landscapes at the Di Rosa collection, Gatehouse Gallery: The natural environment serves as both medium and muse for the seven artists in Radical Landscapes who reflect on a range of larger concerns including climate change, surveillance, and identity. Taking romantic notions of landscape and the sublime as points of departure, this exhibition presents contemporary approaches to nature that reflect our rapidly evolving world. As boundaries between disciplines in visual culture become blurred, art that engages with the natural environment frequently connects to scientific, historical, and philosophical ideas. Through a range of media, the artists in this exhibition upend familiar, anodyne approaches to landscape and instead present work that critically examines our relationship to the natural world. The Di Rosa collection is located at 5200 Sonoma (Carneros) Highway in Napa. Erik Desmazieres “La Salle des Planetes” for “The Library of Babel” by Jorge Luis Borges. Image courtesy of the Kadist Foundation. Saturday, February 6th 12-7pm – SF Art Book Fair Pop-up: For the second consecutive year, Kadist is hosting 14 local booksellers, independent publishers, and artists for the SF Art Book Fair pop-up. With limited physical platforms to locally support the distribution of art books, this event aims to provide a unique access to the Bay Area’s publishing community and their recent work. Alongside the event, Kadist will present a series of events, view the full schedule here. The Kadist Art Foundation is located at 3295 20th Street, in San Francisco. Nellie King Solomon, Untitled painting on paper. Image courtesy of Berkeley Art Center. Saturday, February 6th, 6 – 8pm –Opening Reception for HERE, Part II: BAC Artist Annual Exhibition at the Berkeley Art Center: “In many ways abstract paintings are fictional models. They render visible what we cannot otherwise see or describe. They propose a new real to be imagined. In a world increasingly saturated by instant images, abstract painting reminds us of the unique individual mark-maker and compels a closer consideration of the process before the image. In this space of the postponement of the image that is neither directly relational or ideological, we might reflect, consider and pause. I was struck by the abundance of abstract work in all media in Here Part I, and wanted to pose questions around the subject of Abstraction—an area of art practice that remains a through-line from modernism until now. What does it mean to think about abstraction and more specifically, what does it mean to think about abstraction in painting? The six artists selected, Katie Hawkinson, Edith Hillinger, Anthony Pinata, Nellie King Solomon, Rik Ritchey and Kimberly Rowe show a dedication in their work to the investigation of abstraction and its history—and reshape new abstraction through their unique investments in expanded practices.” – Natasha Boas, Curator. There will be a conversation with Curator Natasha Boas and BAMPFA Director Larry Rinder titled “What does it mean to think about abstraction?” on Wednesday, February 24th at 6 pm. The Berkeley Art Center is located at 1275 Walnut Street, Berkeley. Young Suh “Birthday”, 2014, photograph. Image courtesy of Mills College Art Museum. On-going to March 13th – Can We Live Here? Stories from a Difficult World at Mills College Art Museum: Photographer Young Suh and Poet Kate Peterson create new work in their first collaborative exhibition together, featuring photography, video, installation, and performance. Drawing on a shared interest in landscape developed in different media, their project examines the struggle of humans to survive in a rapidly changing natural world, and the shifting concepts of nature that govern that world. Mills College Art Museum is located at 5000 MacArthur Blvd in Oakland.